These are the latest sculpted bas releif and egg tempera fresco paintings by artist Linda Paul. I started a series of sketches inspired by my love of Italian design and imagery. I channeled my inner Italian. I sketch in red chalk as did the Italian maters of the Renaissance. In the first sketch, I designed a border of interlacing leaves and berries with the four corners having a berry and leaf design. The center is an Italian design inspired medley of fruit. In the second sketch I designed a wheat border and herb corners. I was inspired to create these paintings with a monochromatic color scheme as it was February and I was feeling a tad colorless. I followed my mood, heart and inspiration. I sculpted all of the elements in these artwork in bas-relief. The first artwork, fresco wall with fruit, has in its centerpiece, olives, a half peeled orange, pineapple, berries, lemon, pear, grapes and lovely art nouveau leaves. The matching art work, Fresco Wall with veggies has a medley of assorted vegetable including an artichoke, corn, beans, peppers, garlic, onion, tomatoes all being held up by spears of asparagus. I sculpted each grain of wheat in the border individually. The four corner pieces are all different herbs plants. I did a little study painting of a fleur de lis to test out my monochromatic color scheme, fleur di lis means "flower of lily" in French. 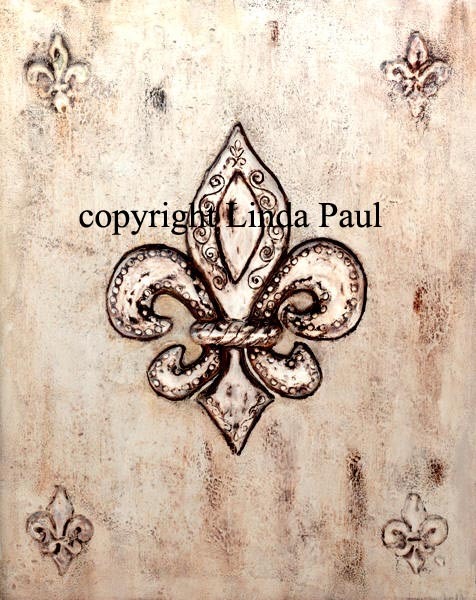 Since Hurricane Katrina, the fleur de lis has become a unifying symbol for the people of New Orleans. The symbol has always been a presence in Louisiana but has become more prevalent lately. It is widely viewed as a symbol of the rebuilding of the city and as a reminder of home. In the picture above, I have started painting the wheat border with a monochromatic wash of a beautiful reddish brown iron oxide called Caput Mortem.. If I was an artist doing this in the sixteenth century I would use the original Caput Mortum (literally translated as death's head) which was a pigment made from the wrappings of mummies, but adapted for today's world, (and a lack of available mummies), I am going to use a caput mortem natural iron oxide which has complex layerings of reddish brown and black colors.